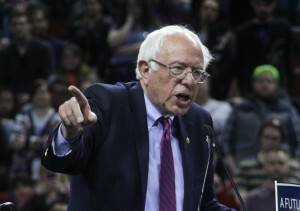 U.S. Sen. Bernie Sanders on Friday urged Democratic Party Chairwoman Debbie Wasserman Schultz not to stack the committees that will draft the rules and lay out the party platform at this summer’s Democratic National Convention. In a letter to the party chairwoman, Sanders said the makeup of the standing committees should reflect the relative level of support that he and Hillary Clinton received in primaries and caucuses. So far, Sanders has won about 45 percent of the pledged delegates. Both campaigns deserve a say at the convention this July in Philadelphia, the senator said. Under party rules, Wasserman Schultz recommends 25 at-large appointments to the party’s executive committee for each of the three standing committees; rules, platform and credentials. Wasserman Schultz has forwarded only three of 40 names the Sanders campaign recommended for the key committees while installing Clinton loyalists in leading roles. Connecticut Gov. Dannel Malloy was put in charge of the Platform Committee, for example, and former Rep. Barney Frank of Massachusetts was tapped to head the Rules Committee. How the party leadership comports itself at the convention will affect Democrats’ chances of winning the general election this November, the Vermont senator said. “If we are to have a unified party in the fall, no matter who wins the nomination, we cannot have a Democratic National Convention in which the views of millions of people who participated in the Democratic nominating process are unrepresented in the committee membership. That sends the very real message that the Democratic Party is not open to the millions of new people that our campaign has brought into the political process, does not want to hear new voices and is unwilling to respect the broader base of people that this party needs to win over in November and beyond,” Sanders wrote to Wasserman Schultz. The letter warned that if committee assignments aren’t fairly allotted one result could be floor fights. Under party rules, minority reports may be brought before the full convention at the request of 25 percent of the platform, credentials and rules committees. “If the process is set up to produce an unfair, one-sided result, we are prepared to mobilize our delegates to force as many votes as necessary to amend the platform and rules on the floor of the convention,” Sanders wrote. Read Sanders’ letter to Wasserman Schultz here. ← Hillary Clinton Has Been Avoiding California! Here’s Why!